Urban transportation company Uber is fighting very hard to conquer France. It doesn’t hesitate to redistribute bonuses of up to $1,100 a week to its drivers — these bonuses are higher than Uber’s revenue from these drivers. In other words, Uber is willing to operate at a loss for some drivers to lure drivers. Under-funded French startups can’t compete financially with Uber’s offering with similar bonuses, but rely on a more relationship-building approach. There are many urban transportation startups in France, such as LeCab, Chauffeur-privé, SnapCar, Allocab and Drive. Some services (like LeCab) buy and operate their own cars. But for other services drivers have to bring their own cars. In the latter case, many of them have signed up to multiple urban transportation services. For example, they can switch between Uber and Chauffeur-Privé throughout the day, as Chauffeur-Privé has a mixed model. Uber has three different strategies right now in Paris to encourage driver loyalty. The first one targets drivers who use multiple services. Uber wants to convince them to only use Uber. Drivers have a weekly bonus that depends on the number of rides they do every week. For fashion week, these bonuses will be augmented by €100. That’s why Uber recently sent out an email to drivers. “As always, you will have to have a rating above 4.5 stars and an acceptance rating above 80 percent during the week to qualify for the bonus,” says the email. If you are an UberX driver and do more than 40 rides a week, you get $480. For 60 rides, you get $760. And finally, for more than 75 rides, you get $1,100 (respectively €350, €550 and €800). Let’s say that on average an UberX ride costs $25 in Paris (€18). Uber takes 20 percent, representing $370 per week for 75 rides (€270). Uber is willing to give away $1,100 every week when it generates $370 in revenue, or three times its revenue. For black car drivers, you will get $345 for 40 rides, $620 for 60 rides and $970 for 70 rides (respectively €250, €450 and €700). In France, black car and UberX drivers are both professional drivers with a limo license. Only UberPOP accepts non-professional drivers. “It’s a very attractive bonus as Uber pays us more than they take from us,” an Uber driver told me in a phone interview. Second, Uber is launching a new referral strategy. Existing Uber drivers can convince other professional limo drivers who don’t already work for Uber. As a reminder, in France, urban transportation startups can’t recruit brand new drivers for the next two months due to an ongoing conflict with French cab drivers. To get more drivers, an important part is luring drivers on other services or convincing existing ones to drive more for Uber. But, according to competitors, Uber still receives many applications from existing professional license holders. If you refer a new Uber driver and this person does more than 20 rides on Uber, you receive $690 (€500). On the other hand, the new driver will receive $345 (€250). It adds up with the other bonus described above. Uber is spending more than $1,000 dollars for 20 rides. It doesn’t end here. Many French companies allow you to say where you want to be dropped off directly within the app. For example, Chauffeur-Privé drivers can accept a ride before they drop someone off. This way, they don’t have any downtime between rides. To counterbalance that, Uber is giving drivers $14 (€10) if they do three Uber rides in a row, or $28 (€20) for five rides in a row. “It’s an experiment that we are doing with a few drivers,” an Uber spokesperson told me in a phone interview. Recruiting More Drivers Or Killing Competitors? I asked Uber about all these bonuses. Uber sees them as incentives to make drivers discover the service. It’s the first step to build a long term relationship. Now that it’s harder to recruit drivers in France, urban transportation companies have no choice but to be more effective in the stagnant pool of drivers. But does Uber need more drivers in Paris? Uber rarely suffers from surge pricing in Paris, and there are many available cars when you open the app. “It doesn’t have any supply issue,” Hascoet told me. “Our rides-per-hour ratio is much higher than Uber’s, while still being able to answer to 98 percent of ride requests.” According to him, Uber’s tactics are specifically targeted towards its French competition. Today’s news comes after multiple incidents in the U.S. In New York, Uber has used DDoS-style techniques against Gett Cars. In San Diego, Uber voluntarily kept drivers off the road to drive prices up with surge pricing. For French drivers, Uber’s strategy is great to boost their incomes. But its image suffers. The company is seen as the giant American player that tries to invade France. Interacting with Uber is very cold. In the end, startup founders are complaining about Uber’s tactics, but they are not illegal. It’s unfair for French competitors, but Uber benefits from hundreds of millions of dollars in funding. It can use bonuses to gain market share. The following are emails recently sent to Uber drivers in Paris. 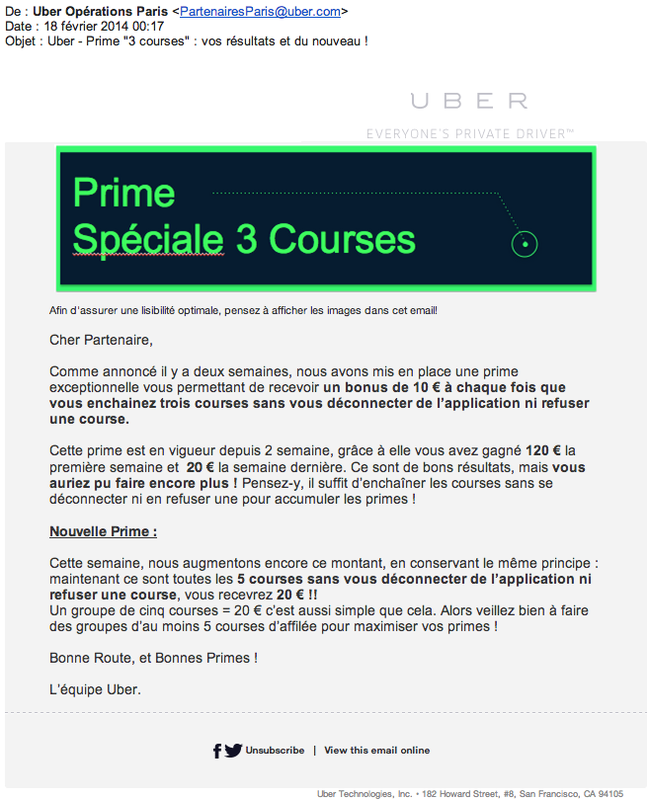 Objet: Uber : Nouvelle prime exceptionnelle ! Vous le savez, nous cherchons toujours de nouveaux moyens de vous satisfaire et de rester le meilleur réseau de partenaires VTC du marché. C’est pourquoi nous mettons en place dès aujourd’hui et à titre expérimental une nouvelle prime, pour laquelle vous avez été sélectionné. La demande explose en ce moment, aussi bien sur Berline que sur uberX, et les utilisateurs ont besoin de chauffeurs connectés autant que possible et à tout moment. A chaque fois que vous enchainerez trois courses sans vous déconnecter de l’application ni refuser une course, vous recevrez une prime de 10 €. Pensez-y : il n’y a pas de commission sur les primes, cela correspond donc à une course de 12,50 € (10 € après commission) OFFERTE toutes les 3 courses ! En respectant les critères, vous pouvez rapidement et aisément accumuler des centaines d’euros de prime par semaine. Cette prime est pour l’instant en phase expérimentale en vue d’être éventuellement élargie à tout le réseau, c’est pourquoi il est normal qu’elle ne concerne pas tous les partenaires à l’heure actuelle. A très bientôt sur le réseau Uber.